The second generation split the PowerPC (PPC) line into entry level 603 and power user 604 chips. The 603 has only 1.6 million transistors, draws about half as much power as the 601, has two smaller caches (8 KB for instructions, 8 KB for data vs. a 32 KB unified cache in the 601), and can process up 2 instructions per cycle (down from 3 in the 601). 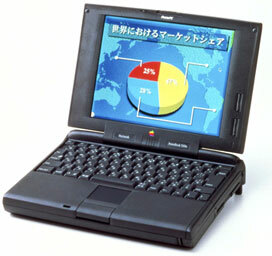 Low power consumption was a key design factor, since Apple wanted to design PowerBooks around the 603. One way the 603 reduced power consumption was with its smaller L1 cache, which so reduced performance that Apple refused to use it in a PowerBook. At that time, 680×0 emulation was crucial, and with such a small internal cache, the 603 handled emulatione very poorly. The 603 has five execution units, up from three in the 601. These is an integer unit, floating point unit, branch processing unit, load/store unit, and system register unit. The 64-bit memory bus of the 603 can run on either a 32-bit or 64-bit data bus, although there is a severe performance penalty when using a 32-bit data bus. With a small redesign, the PPC 603e was introduced. Essentially a 603 with an improved cache (16 KB each for instructions and data, twice as much as the original 603), it offers significantly improved performance without draining batteries too quickly. The Performa 5260 and 6300 were designed around this improved chip, as was every PPC-based PowerBook, starting with the PowerBook 5300. Speeds ranged from 100 MHz to 300 MHz.